When something is in season, you want to make the most of it right? 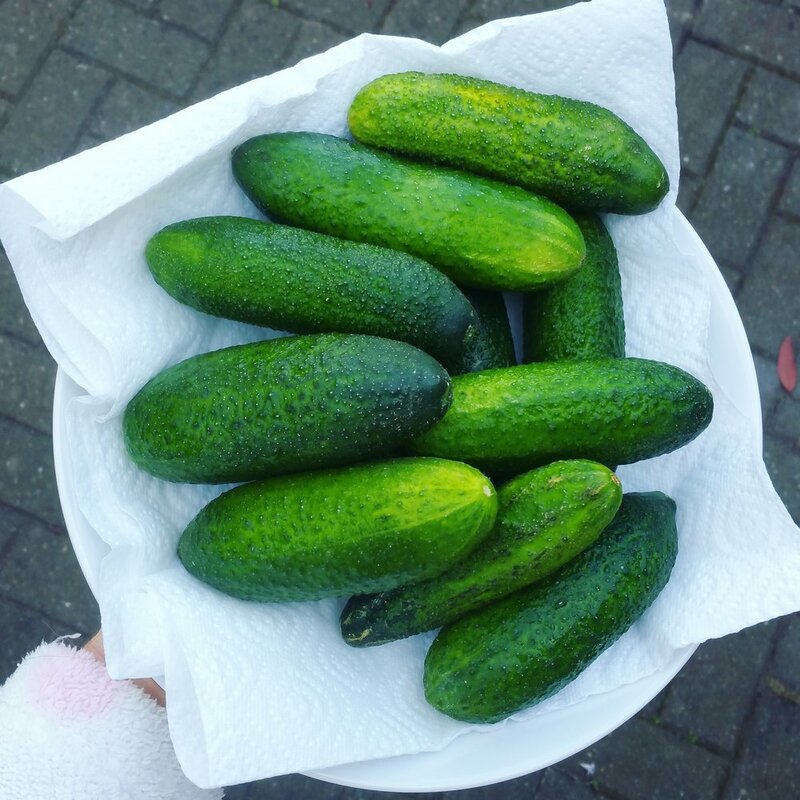 We've had fresh organic gherkins from our suppliers Organic North coming in over the last few weeks, which got me drooling over the thought of cold, crunchy pickles. Having a go last weekend, chatting with my mum at the kitchen table, her painting, both drinking coffee, felt like something out of a home magazine spread. The whole process is cheap, easy, satisfying and delicious; I highly recommend giving it a go. Start off by washing your gherkins. I gave mine a gentle scrub too with a soft brush. Dry them well. I read that if you want your gherkins crunchy then you need to draw the water out of them. Do this with salt and 24 hours! Sprinkle with a good amount of salt and cover with a cloth or teatowel. Drain off the water and dry them again after 24 hours. You gotta clean your receptacles really well. Warm soapy water, lots of rinsing etc. My mum showed me a nice trick if you have a microwave. Put an inch of water in the bottom of your jar and microwave for 90 seconds. The steam sterilies them! You can pickle the gherkins whole or sliced - up to you! Some of my jars were small so we went for sliced (veggie burger ready). For the brine, the general rule seems to be equal parts vinegar to water. You can use more vinegar if you want, I think it's all about experimenting! I used white vinegar for mine, equal parts. Now for the spices: some people recommend boiling up your spices with the brine, others say pop them in the jar with the gherks and that will infuse well enough. I opted for cooking them up in the brine, except for the fresh dill which was added at the end. Spices and herbs - let your imagination take over! I went for whole garlic cloves, coriander seeds, mustard seeds, black peppercorns and fresh dill. 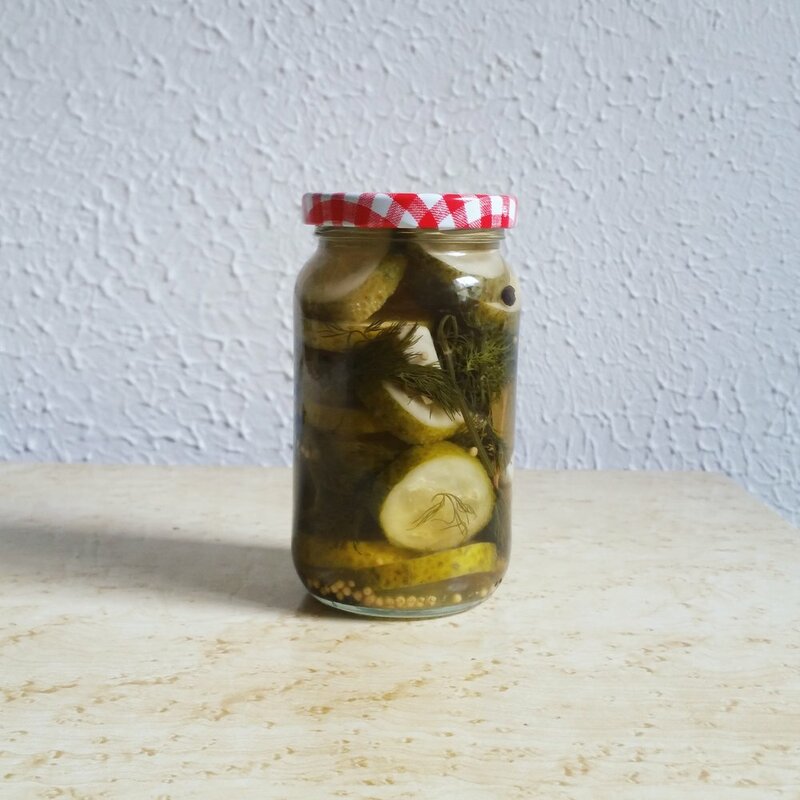 Some people add salt and/or sugar to their brine for a sweeter pickle. I'm into sour so I left out the sugar and salt (as I'd already salted the gherks prior to jarring. Bring the brine to the boil and simmer for 5 minutes. Leave to cool until warm/tepid, then pour into the jars over your gherkins. Store in the fridge and leave at least a few days before opening. The longer, the stronger (better).